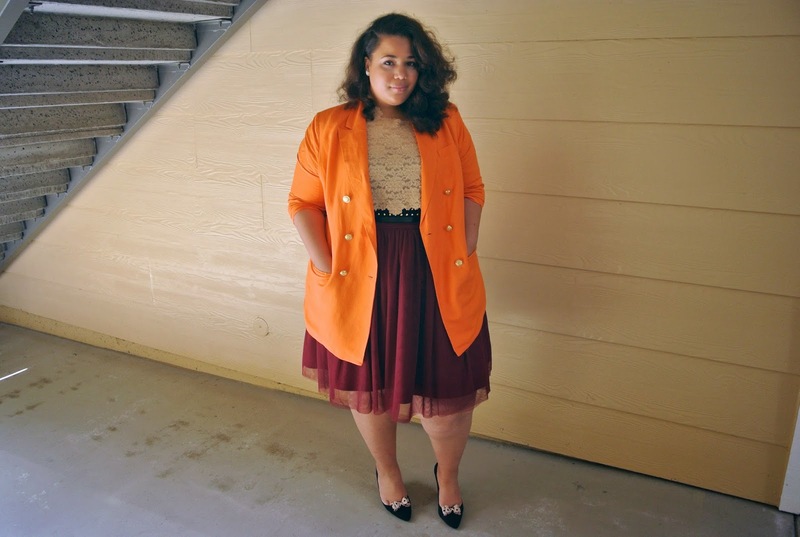 If you hang out with me via Facebook you'd know that I'm the new writer for About.com plus size fashion section. 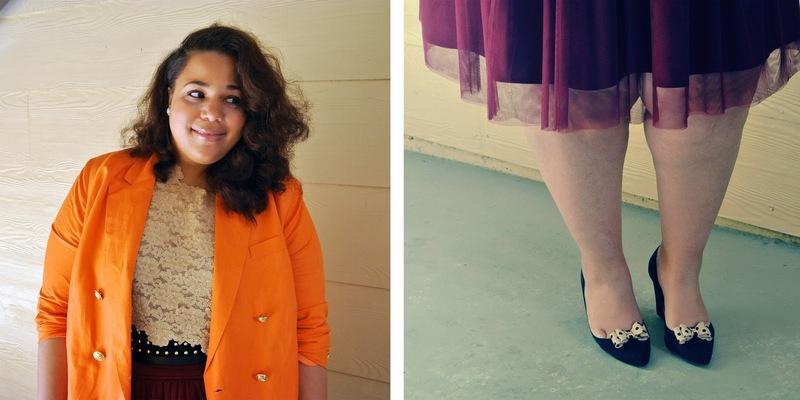 A recent article I wrote spoke on how to wear your ballerina skirt perfectly. I wanted to continue the conversation over here as it pertains to including a tutu in your work wardrobe. I know work wardrobes can get boring with black skirt, black pants, black this and black that. 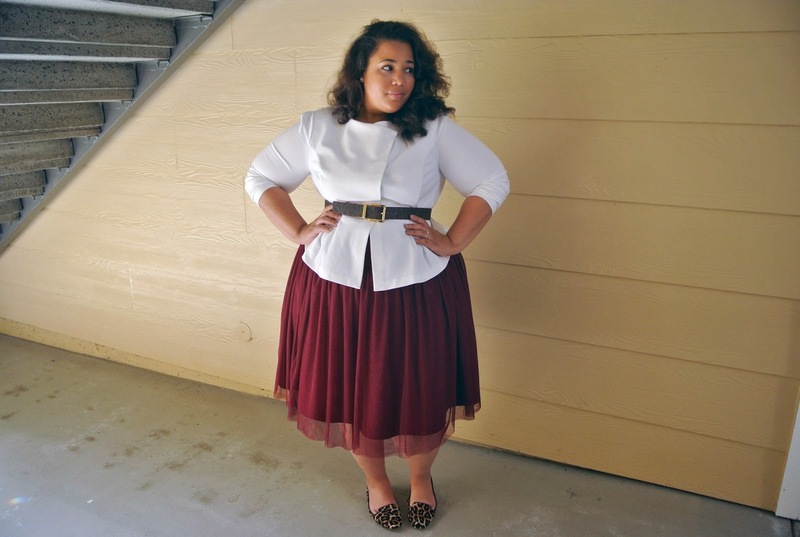 As I continue with my GwynnieBee clothing subscription (get one free month here), I borrowed this tulle skirt that I think is the absolute perfect working girl's ballerina skirt. It has only two layers of tulle. You can walk in the office with a little flare, but no one will look at you crazy. To give this skirt an office appropriate look I paired it with work staples, blazers and a buttons up. For most of you 9-5 working girls these should be garments that you already have in your closet. I also wanted to touch on using this wine color and transitioning it into spring. Wine is usually considered a fall color, so I brightened it up with the tops and blazers that I chose to pair it with. You just add in spring colors into the look to bring it into the warmer season. 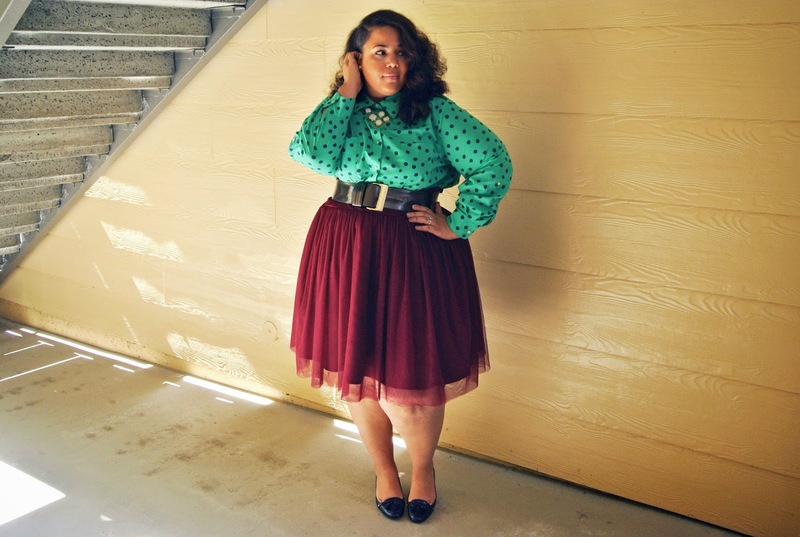 Style Notes: This skirt is Kiyonna via GwynnieBee. I'm wearing a 2X in it. I thought the waist was a little big, so you may want to take that into consideration when choosing a size. If you want to know more about how GwynnieBee works check my previous post here. If you want to know how I styled my hair I actually watched a youtube video. You can see it here. Also, you may notice that some of the items I am wearing are sold out. I do the one piece three ways to help people shop their own closets when they introduce a new piece. I make sure the focus piece is currently available, but then I add in pieces from my own closet. So some of the items shown are older and no longer available. Finally, I'm wearing shoe clips on my black wedges. It's such a cool concept for people like me who don't buy a lot of shoes. I don't buy a lot of shoes because I want to be comfortable and it's hard to find a lot of shoes that are both cute and comfy. I linked the info at the bottom. This post was sponsored by GwynnieBee, All opinions are 100% my own. I love all three styles but I love the one with the green top the most. I love that you style multiple options per post! Great way to see the versatility of items. I have the white and orange blazer so yay me lol. Love all three looks as always! When i first saw you on BuzzFeed i thought "omg so curvy" I'm so jelly. 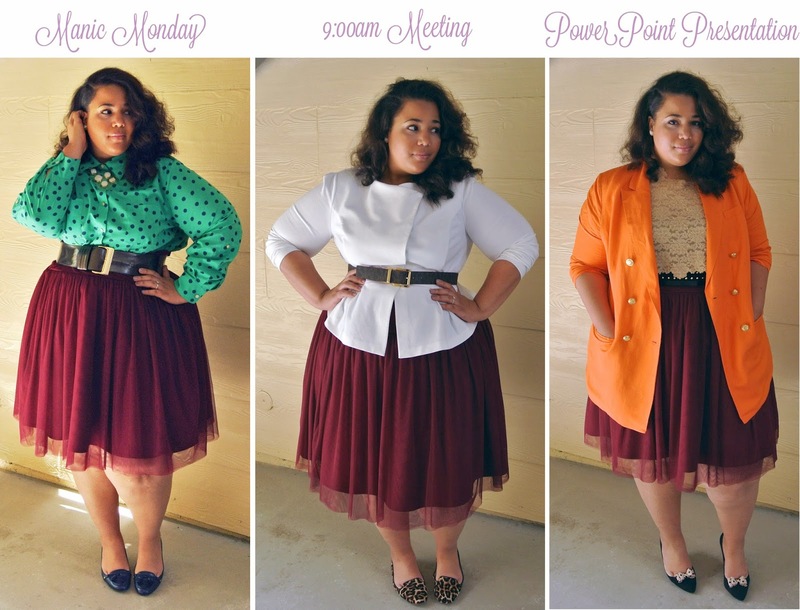 Super cute, my favorite is the second look! Cute outfits and yay on the new gig! I'll be sure to check it out! Just say in your head everyday...it's almost Friday and soon it will be...LOL. Thanks love! My favourite look is with the polka dot shirt. I love everyother look too.